By Alan Condon | December 4, 2012. One of the fastest growing sports in Ireland, white collar boxing has exploded into mainstream society and is the sport that everybody is talking about. For those who have not heard of white collar boxing, it is a relatively new sport, born in the legendary Gleason’s gym in New York in 1988. The first bout took place between an attorney and a man with a Phd in English literature – not your stereotypical pugilist background. The bout was a massive success and since the release of reputable boxing films like “Million Dollar Baby” and “Cinderella Man”, white collar boxing membership in the US has tripled in numbers. The sport beckons average and inexperienced members of society to challenge themselves with the intense motivation and discipline that the sport generates. 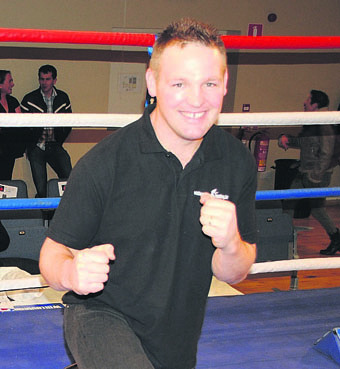 Whitecollarboxing.ie was founded by former Olympian and Irish professional boxer, Cathal O’Grady, who says his objective is to bring the benefits of boxing to a previously neglected audience. “White collar boxing challenges you to be a contender. Swap the safety of your office chair for the thrill and adrenaline rush of the boxing ring. We believe that boxing can help individuals in their everyday lives whether dealing with pressurised situations, or calling on courage to overcome fears,” says O’Grady. White Collar Boxing Ireland is equipped with an immense coaching and training staff who specialise on teaching adult beginners the noble art of boxing. The coaching staff all have a background in either amateur or professional boxing, with some having competed in the Olympic Games and others carrying experience from several professional title fights. On 23rd November in the Nuremore hotel in Carrickmacross, White Collar Boxing Ireland organised a charity bout for Carrick Cancer Care which featured a face-off between Ireland’s Olympic medallists Paddy Barnes and Michael Conlon, which was a huge success. This month white collar boxing travels to Ardee, Carlow and Waterford, organising events entitled ‘The Trilogy 2’, ‘The Clash of the Titans’, and ‘The Brawl in the Hall’ respectively. The white collar boxing scene is no stranger to famous faces, with Michael Conlon, Paddy Barnes and Irish favourite Katie Taylor recently getting involved and showing their support. Cathal O’Grady and his team are famous up and down the country for organising rival GAA club bouts, which always bring a great atmosphere and added humility to the local competitors. Boxers are among the most respected elite athletes in the world due to their superior conditioning, physical fitness and sheer determination to succeed. For those of you intent on keeping your keep-fit New Years’ resolutions in 2013, look no further than White Collar’s mixed boxing class starting the 14th January. The mixed training programme consists of eight weeks coaching at the National Stadium Gym, with the added incentive of your own amateur bout at the end.